Keith Secola is often compared to Neil Young and Bruce Springsteen. 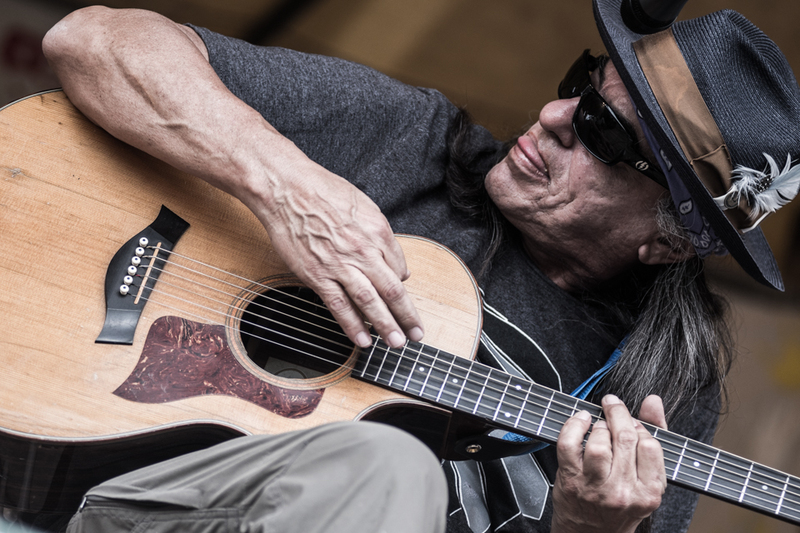 He is a songwriter of the people and his genre is Native Americana. His decades of work as a composer, singer, songwriter, producer and entertainer have made him an icon and ambassador of Native music. Keith's gift for storytelling is truly astounding, combining elements of folk, rock and roll, blues, jazz, reggae, world music and electric 49 (pow-wow rock) with large doses of humor and wit. Keith plays guitar, flute, mandolin, banjo, harmonica and piano, while singing in both English and Anishinaabe. NDN Kars (Indian Cars), his most popular song, is considered the contemporary Native American anthem, achieving legendary status and earning him a well-deserved cult following. Keith has been featured in documentaries and films, and has performed at the Olympics, the Kennedy Center and events all over Europe. Now he's back at Hunt Country to share an evening with us!